We finally know what to expect from Dontnod’s long-awaited Life is Strange sequel, thanks to two brand new trailers and official reveal event at Gamescom. 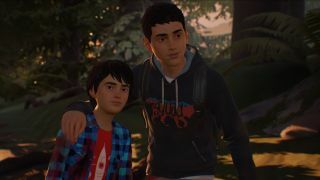 Life is Strange 2 is a five-part episodic adventure which focuses on two new protagonists - brothers Sean (16) and Daniel (9) Diaz. The pair live a fairly normal life in Seattle, Washington until a tragic accident forces them to run away from home. Terrified of being caught by the police - and ultimately separated - the brothers set off on a road trip to their family’s hometown of Puerto Lobos, Mexico in hope of a better life. Life on the road is tough, especially for playable character Sean - who must be a role model to his younger brother while coming to age himself. Sean’s actions will have an impact on Daniel and, as in its predecessor, supernatural powers will be involved somehow - but Dontnod are still being pretty secretive about exactly how. Gameplay footage is expected to be revealed in the next few days. The first episode of Life is Strange 2 will release on September 27 for Xbox One, PlayStation 4 and Steam. The remaining four episodes will be released at later (undisclosed) dates.